Knock their socks off with this delicious, super-easy Cheddar-Dill Bread. No fancy skills (or yeast) required. Mix flour, baking powder, salt and dill weed in large bowl; cut in butter with pastry blender or 2 knives until mixture resembles coarse crumbs. Stir in cheese. Whisk eggs and milk until blended. Add to flour mixture; stir just until moistened. Spoon into 9x5-inch loaf pan sprayed with cooking spray. Bake 1 hour or until toothpick inserted in center comes out clean. Immediately remove bread from pan; cool completely on wire rack. Enjoy a slice of this cheesy bread on occasion with your entree. If the last few slices of your quick bread are a bit dried out, toast them in the toaster, then serve them spread with PHILADELPHIA Cream Cheese Spread or butter. 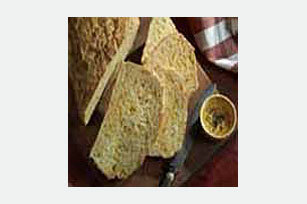 Substitute KRAFT Sharp Cheddar Cheese for the CRACKER BARREL Cheese. Or for a quick and easy alternative, use KRAFT Shredded Sharp Cheddar Cheese.